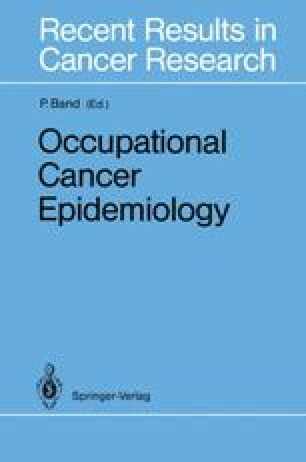 Establishing a causal association between an occupational exposure and the incidence of cancer requires the consideration of many criteria. One of these is whether an association between level of exposure and risk has been demonstrated. For this purpose an association between an ordinal measure of exposure (e.g. three exposure categories) and risk is generally considered sufficient. Once a causal association has been established with reasonable certainty, interest often focusses on a more quantitative relationship between an absolute measure of exposure and risk — for a given quantity of exposure, what is the increase in risk? In particular, estimates of such relationships are required to inform the process of setting standards for “acceptable” limits of exposure. This paper is relevant mainly to these quantitative estimates of exposure-response relationships. Supported by a grant from the Institut de recherche en santé et sécurité au travail.